County Auditor Karl Keith is hosting informational workshops around the county in February and March for property owners to learn how to file a formal property value appeal. DAYTON — Montgomery County Auditor Karl Keith is hosting informational workshops around the county in February and March for property owners to learn how to file a formal property value appeal to the Board of Revision (BOR) and what types of evidence to prepare for an appeal hearing. The Board of Revision (BOR) is a quasi-judicial body in county government and is responsible for conducting hearings to determine the taxable value of property. It allows individuals to present evidence to suggest a need for a change in a property’s value. Representatives from the County Treasurer, County Commission president and County Auditor sit on the board. Upon completion of the 2017 update of property values, all final property values were released in December. Property owners received a notice of their final property value in the mail. The final values can also be viewed online today at www.mcrealestate.com. Although the final values have been released, there is still time for property owners to file a formal appeal with the Board of Revision before the April 2 deadline. Property owners can file an appeal online at www.mc-bor.org. The formal appeals process with the Board of Revision represents the final opportunity for community input for the Montgomery County property value update. 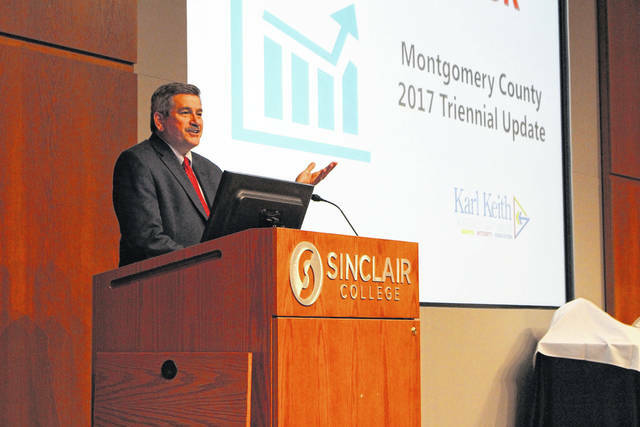 Keith is hosting six different information sessions at locations around Montgomery County during February and March to provide property owners a chance to receive additional information, ask questions and talk with staff about the formal review process. • Feb. 8 from 6-7 p.m. at the Dayton Area Board of Realtors, 1515 S. Main Street, Dayton. • Feb. 13 from 6-7 p.m. at the New Lebanon Village Hall Community Room, 198 S. Clayton Road, New Lebanon. • Feb. 22 from 6-7 p.m. at the Englewood Government Center Council Chambers, 333 W. National Road, Englewood. • March 1 from 6-7 p.m. at the Miamisburg Community Center, 305 E. Central Avenue, Miamisburg. • March 6 from 6-7p.m. at the Kettering Government Center, 3600 Shroyer Road, Kettering. • March 8 from 6-7 p.m. at the Washington Township Recreation Center, 965 Miamisburg Centerville Road, Dayton. Property owners can visit www.mc-bor.org for more information about the Board of Revision and for a listing of informational workshops. Reach the Montgomery County Auditor’s office at (937) 225-5640.